There is no estimate on when the iPad 3 jailbreak will be publicly available, though typically things move quick from discovery to release. Because the iPad 3 shares a similar processor to the iPhone 4S and iPad 2, it’s quite likely those two devices will become jailbroken along the way. Assuming things go well, it’s possible some variation of an iOS 5.1 jailbreak for A5 devices will become available within a week or two. 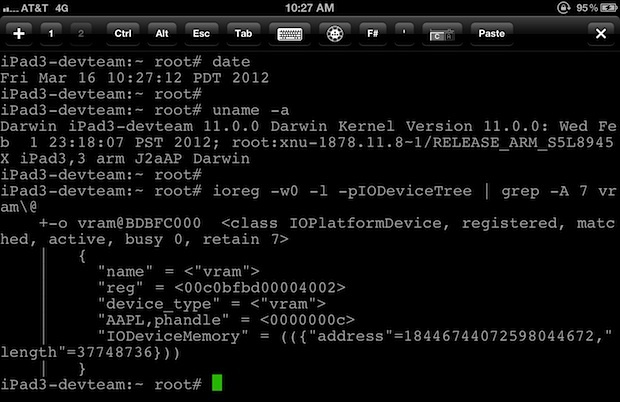 Currently, iOS 5.1 is jailbreakable as tethered for older hardware only. Stay tuned for more. I’m always glad to see people working to ensure that the owner and user of a computer retain the right to run whatever software they choose on it; it’s really important to fight back against the trend (led by Apple, but not unique to them) of selling closed, locked-down boxes that treat their owners as either criminals or children. As Cory Doctorow says, there’s a coming war against general purpose computing, and we can’t get started too quickly in winning it. That said, I think an even better way to fight back is to simply not buy such systems in the first place. Who really needs a laptop with a missing keyboard, which is all that an iPad really is? Why do people feel compelled to slavishly throw money at Apple every time they come out with a new product? 1) why jailbreak my ipad3?